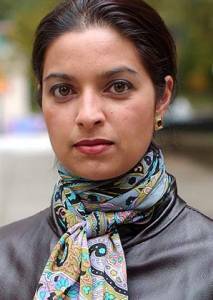 Jhumpa Lahiri, the author of two very famous novels, writs about what it means to be all three: Indian, American and Indian-American. I have lived in the United States for almost 37 years and anticipate growing old in this country. Therefore, with the exception of my first two years in London, “Indian-American” has been a constant way to describe me. Less constant is my relationship to the term. When I was growing up in Rhode Island in the 1970s I felt neither Indian nor American. Like many immigrant offspring I felt intense pressure to be two things, loyal to the old world and fluent in the new, approved of on either side of the hyphen. Looking back, I see that this was generally the case. But my perception as a young girl was that I fell short at both ends, shuttling between two dimensions that had nothing to do with one another. At home I followed the customs of my parents, speaking Bengali and eating rice and dal with my fingers. These ordinary facts seemed part of a secret, utterly alien way of life, and I took pains to hide them from my American friends. For my parents, home was not our house in Rhode Island but Calcutta, where they were raised. I was aware that the things they lived for–the Nazrul songs they listened to on the reel-to-reel, the family they missed, the clothes my mother wore that were not available in any store in any mall–were at once as precious and as worthless as an outmoded currency. I also entered a world my parents had little knowledge or control of: school, books, music, television, things that seeped in and became a fundamental aspect of who I am. I spoke English without an accent, comprehending the language in a way my parents still do not. And yet there was evidence that I was not entirely American. In addition to my distinguishing name and looks, I did not attend Sunday school, did not know how to ice-skate, and disappeared to India for months at a time. Many of these friends proudly called themselves Irish-American or Italian-American. But they were several generations removed from the frequently humiliating process of immigration, so that the ethnic roots they claimed had descended underground whereas mine were still tangled and green. According to my parents I was not American, nor would I ever be no matter how hard I tried. I felt doomed by their pronouncement, misunderstood and gradually defiant. In spite of the first lessons of arithmetic, one plus one did not equal two but zero, my conflicting selves always canceling each other out. When I first started writing I was not conscious that my subject was the Indian-American experience. What drew me to my craft was the desire to force the two worlds I occupied to mingle on the page as I was not brave enough, or mature enough, to allow in life. My first book was published in 1999, and around then, on the cusp of a new century, the term “Indian-American” has become part of this country’s vocabulary. I’ve heard it so often that these days, if asked about my background, I use the term myself, pleasantly surprised that I do not have to explain further. What a difference from my early life, when there was no such way to describe me, when the most I could do was to clumsily and ineffectually explain. As I approach middle age, one plus one equals two, both in my work and in my daily existence. The traditions on either side of the hyphen dwell in me like siblings, still occasionally sparring, one outshining the other depending on the day. But like siblings they are intimately familiar with one another, forgiving and intertwined. When my husband and I were married five years ago in Calcutta we invited friends who had never been to India, and they came full of enthusiasm for a place I avoided talking about in my childhood, fearful of what people might say. Around non-Indian friends, I no longer feel compelled to hide the fact that I speak another language. I speak Bengali to my children, even though I lack the proficiency to teach them to read or write the language. As a child I sought perfection and so denied myself the claim to any identity. As an adult I accept that a bicultural upbringing is a rich but imperfect thing. While I am American by virtue of the fact that I was raised in this country, I am Indian thanks to the efforts of two individuals. I feel Indian not because of the time I’ve spent in India or because of my genetic composition but rather because of my parents’ steadfast presence in my life. They live three hours from my home; I speak to them daily and see them about once a month. Everything will change once they die. They will take certain things with them–conversations in another tongue, and perceptions about the difficulties of being foreign. Without them, the back-and-forth life my family leads, both literally and figuratively, will at last approach stillness. An anchor will drop, and a line of connection will be severed. I have always believed that I lack the authority my parents bring to being Indian. But as long as they live they protect me from feeling like an impostor. Their passing will mark not only the loss of the people who created me but the loss of a singular way of life, a singular struggle. The immigrant’s journey, no matter how ultimately rewarding, is founded on departure and deprivation, but it secures for the subsequent generation a sense of arrival and advantage. I can see a day coming when my American side, lacking the counterpoint India has until now maintained, begins to gain ascendancy and weight. It is in fiction that I will continue to interpret the term “Indian-American,” calculating that shifting equation, whatever answers it may yield.